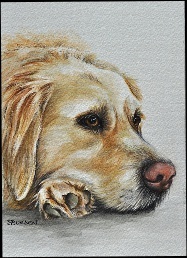 "Mesmerizing expressions captured in pencil or watercolor"
Preserve special memories of your furry and non-furry family with a commissioned painting! Using your favorite photos I surpass that image painting a portrait noted for it's captivating expression. While doing so I ask that you provide a sentence or two; sharing your pets personality, what makes them unique. Choose from single subject 5x7" portraits for $165*, 8x10" starting at $250* or 11x14" starting at $340 to larger than life sizes and group portraits. I also provide hand painted ceramic pet ornaments for $75 each. Any choice results in quality work you, or someone you love, will cherish. Belong to a 501C animal rescue society I partner with? I donate a percentage of your commission back to that organization. No deposit required. Payment due in full upon completion. Gift certificates available. Pick up/mailing times depend on bookings ahead of yours, but I do my best to work with my clients so don't hesitate to ask. To commission your portrait: Contact me with the following.